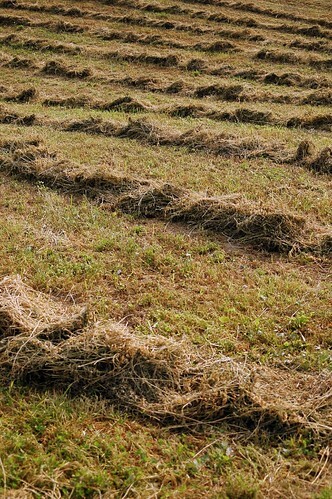 the hay, originally uploaded by jahansell. One day I drove by and the hay was still standing. The next day the tractor was cutting it down. It lay in rows for about three days while I kept forgetting to bring my camera with me. Finally, the day I shot a few pictures, the truck was scooping it up - it's one of the only places I've seen rectangular bales instead of the giant round ones that stay out all winter long. Now the field is bare and brown and will stay that way til next May! Nice picture! Farmers cut the grass once a year, don't they? I bet the fragrance was wonderful! Lovely pattern to the rows in your photo, too. I also bet the fragrance was wonderful . . . thanks for the New England end-of-summer image. Yes, I'm seeing alot of the roll up ones now. wind rows of hay. Nice shot. Very Nice photo : I want to posterize !! !